This lovely little article caught my eye yesterday in the archives of the RSGS (click to enlarge). It’s a cutting from the Scotsman newspaper of 7th May 1888, and it concerns a letter that the Society had received from one of its overseas members. As I skimmed down it, I saw the name ‘Baron von Richthofen’, and instantly thought about the German flying ace of the First World War. ‘The Red Baron’ he was called, and he was a legend in his own time, dying at the tragically young age of 25. Surely this wasn’t the same person, writing to the RSGS about his membership? No… in fact it is his uncle, a man by the name of Ferdinand von Richthofen. It appears that, for some strange reason, Ferdinand’s death had been wrongly reported in British newspapers the previous year, and suddenly his much-valued supply of academic journals had dried up. 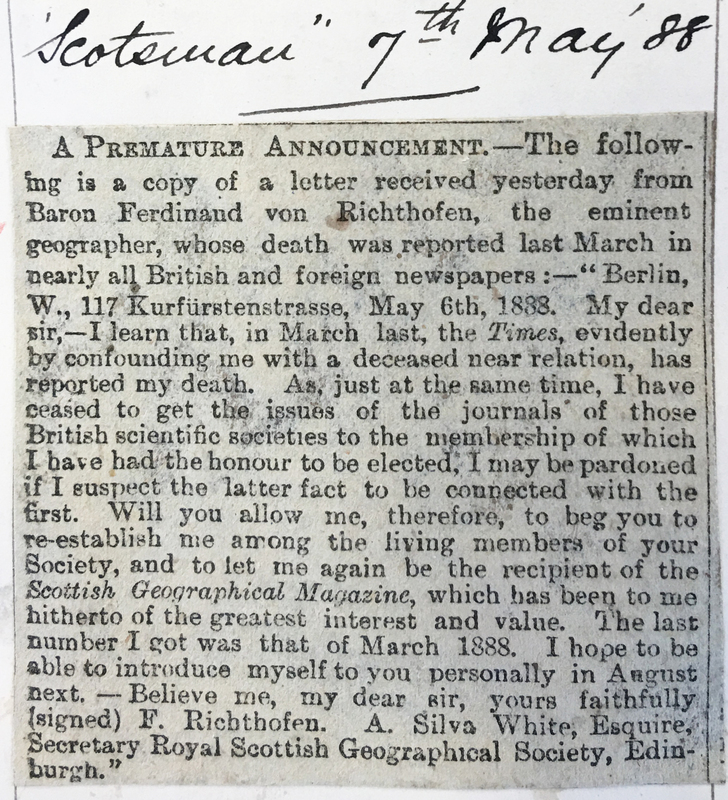 So he was writing to the Secretary of the RSGS to offer proof that he was still alive, and to request – with exquisite politeness – that his name be re-established “among the living members of your Society” so that he could once again receive his copies of the Scottish Geographical Magazine. I love the elegance of his phrasing, and his promise to present himself to the Society in person in the near future, perhaps to dispel any lurking doubt about his existence. What do we know about Ferdinand von Richthofen, apart from the fact that he had a famous nephew? 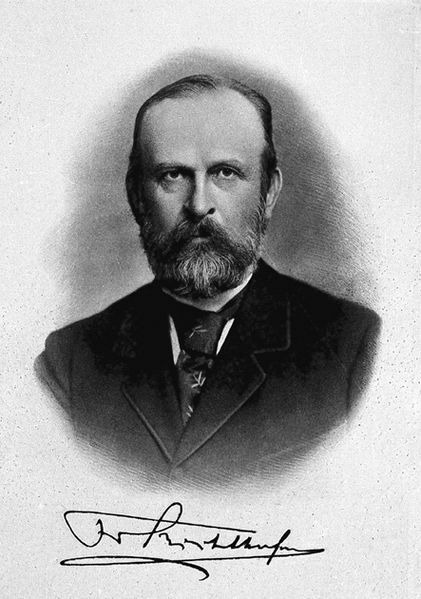 Born in 1833 in Carlsruhe, Silesia (part of the former kingdom of Prussia, in present-day Poland), he was educated in Breslau and Berlin, and he became a greatly respected geographer and geologist. In 1862 he went to California, where his expeditions helped in the location of goldfields, and 10 years later he travelled to China where he undertook a survey of 11 provinces, reporting at great length on their geology and topography and producing a five-volume treatise with an accompanying atlas. He strongly believed that all geography should include a study of human interaction with the environment. Von Richthofen is noted for coining the term ‘Silk Road‘ (in German, ‘Seidenstrasse’), to describe the long trade routes connecting China with the western world. Among his students was the Swedish explorer Sven Hedin, who is one of the people featured in my book, ‘The Great Horizon’. Hedin was a compulsive traveller in his own right, with a special passion for Central Asia. Like his mentor, Hedin followed the trade routes for great distances and his book ‘The Silk Road: Ten Thousand Miles through Central Asia’ was published in 1936. Having inspired a generation of new geographers and travellers, Ferdinand von Richthofen died in Berlin in 1905, aged 72. What a lovely contact to find, and I am glad to see that he would, at least, have been able to enjoy another 17 years’ worth of the Scottish Geographical Magazine. Postscript, 28th January 2017: Further to the above post, my friend Lorna (in the comments below) asked if there was any way to check whether Ferdinand did indeed visit the RSGS. Having perused the Visitors’ Book I was delighted to discover his signature on 21st August 1888. I’m attaching a small snapshot of it here. How nice to be able to link the two, and my thanks to Lorna for inspiring it! Jo Woolf Writer and editor at The Hazel Tree (www.thehazeltree.co.uk) Writer in Residence at the Royal Scottish Geographical Society. A very interesting find, Jo. Thanks for sharing. Thanks, Pat! Glad you found it interesting. I’m amazed by the people who keep turning up in the RSGS records. Most interesting. I wonder if he ever did turn up in person at the RSGS. Do your archives give any hint of that?